At least 22 people died from a storm that swept through the central Philippine islands at the weekend, authorities said Sunday, with rescue operations under way in flood-inundated communities. 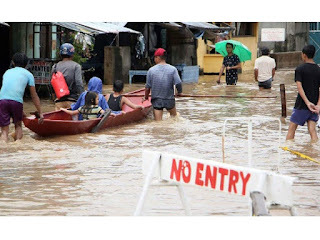 The death toll rose from 4 a day after the storm brought heavy rain to the Bicol and Eastern Visayas regions, causing massive flooding and landslides, the government's office of civil defence said. "Most of the (affected) areas are underwater. We are sending troops and rubber boats to rescue families. In some areas the floods have reached the roofs of homes," Claudio Yucot, head of the Bicol region's office of civil defence, told AFP. Government forecasters said on Sunday that heavy rain would continue over the next 24 hours in the northern Philippines.